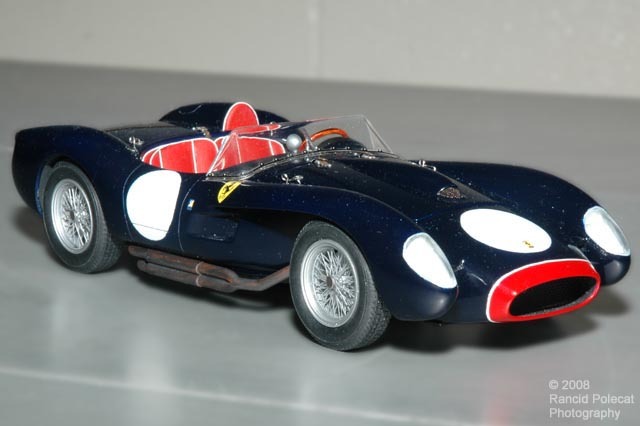 Starting with Hasegawa's recent release of the 1957 Ferrari 250 Testa Rossa, Buzz coated the body in DuPont Nightwatch Blue acrylic laquer. Brad assembled Hasegawa's aftermarket photo-etched wheel set and painted the wheels with Tamiya's Aircraft Silver paint. Brad explained that the molded-on windsheild base had to be sanded off and the windshield buffed out before the Studio 27 two-piece photo-etched base could be used.